Chicago shooting Independence Day weekend: 14 killed and 82 injured in Chicago gun violence over July Fourth weekend. 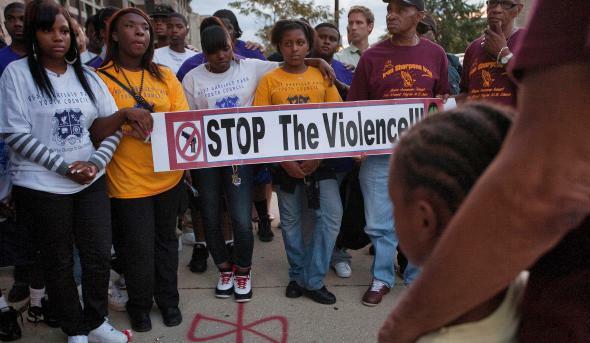 Residents of the West Garfield Park neighborhood marching in September 2012. The bloodiest stretch of the weekend was a 13-hour period between 2:30 p.m. Sunday and 3:30 a.m. Monday when four people were killed and at least another 26 wounded, many of them in critical condition. In 2012, Chicago was the only city in the country with more than 500 recorded homicides (by comparison, there were 414 that year in New York City, which is more than twice as large). Though the number of shooting deaths has dropped slightly this year in the city, the number of shooting incidents overall was up even before last weekend.